Welcome to the Deer Isle Yacht Club! The Deer Isle Yacht Club is a small, local yacht club in Sylvester’s Cove, Sunset, Maine. The Club was founded in 1925 with the purpose of providing facilities and activities for its members in their use of Penobscot Bay and adjacent waters; encouraging amateur yachting, both recreational and competitive; promoting sound seamanship; and fostering knowledge of and respect for the dangers of the sea. Facilities are as minimal as the club has no potable water, no fuel dock, no showers, and little parking. There is a guest mooring is available for visiting sailors suitable for a boat up to about 40 feet. Sailing lessons are provided to Deer Isle residents of any age, but Membership is necessarily limited by the size of the Cove; more information can be found at the Membership section of this website. The DIYC is sorry to report the death of Sally F. Harrison on December 24, 2018, at the age of 93. The following is an excerpt from her Remembrance in the Island Advantages; to read it in full, click here or here. 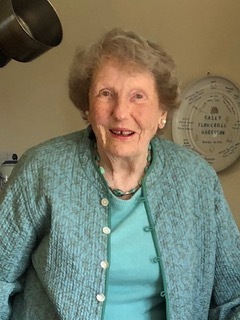 A celebration of her life will be held on August 3, 2019; contributions can be made in her name to the Memorial Ambulance Corp., Island Health & Wellness Foundation or the Deer Isle Library. 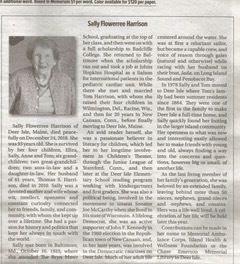 "Sally was a devoted mother and wife whose wit, intellect, openness and constant curiosity connected her to friends, family, and community, with whom she kept up over a lifetime. She had a passion for history and politics that kept her always in touch with the world....Her openness to what was new and interesting easily allowed her to make friends with young and old, always finding a way into the concerns and questions, however big or small, of another life. As the last living member of her family’s generation, she was beloved by an extended family, leaving behind more than 50 nieces, nephews, grand-nieces and nephews, and cousins. Hers was a life well lived."